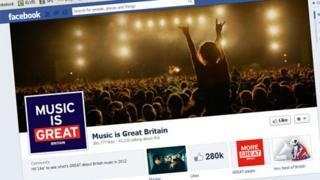 Facebook ads: £100,000 bill for government - good value? Facebook may have been through a sticky patch lately, but plenty of advertisers big and small are still spending substantial sums with the social network. Among them is the UK government, one branch of which has spent about £100,000 to promote Britain as a place to visit. Back in July, when we were investigating the usefulness of Facebook advertising, I got a message telling me that the government's Great campaign was a good example of best practice. It had won nearly half a million "likes" for 13 Facebook pages promoting various aspects of British life, business and culture. But I wanted to know what that had cost, and how much the government was spending more widely with Facebook. So we submitted a Freedom of Information request to the Cabinet Office asking those two questions. We have now received the answers - or at least a partial response. It turns out that as of 19 July, the government had spent £98,418.25 with Facebook on advertising the Great campaign. A spokesman said the campaign had achieved 472 million ad impressions leading to 782,000 ad clicks - and across the 13 Facebook pages, 583,000 "likes" had been generated. As to our second question about the wider use of Facebook advertising by the government, we were told that was not a question for the Cabinet Office, and we would need to contact individual departments. So what are we to make of the spending of nearly £100,000 on one government Facebook campaign? In the context of the overall Great marketing budget of £37m, it is a tiny sum. But is it effective? Evaluating the impact of advertising is a devilishly tricky business, especially when it involves promoting something as amorphous as a corporate or national reputation. As I discovered with my VirtualBagel campaign, Facebook "likes" are a currency whose value is dubious - and some of the army of obsessive clickers who "liked" my non-existent bagels also liked the Great pages. But the Cabinet Office points out that there was also plenty of evidence of real engagement on their Facebook pages, and social media consultants will no doubt applaud the government for creating such a buzz around the campaign for such a modest outlay. Is it possible, however, that the marketing effort would have been just as successful without any expenditure on adverts? Surely with all the Olympics buzz, plenty of people would have come to the Facebook pages anyway - and each of them would have been more valuable and engaged than someone who clicked on an ad? Still, these are very early days for social network advertising and those who use it. Companies big and small - and governments - are still trying to discover whether people who come to networks to socialise are also eager to hear marketing messages. And the answer to that question is crucial to the future of Facebook.